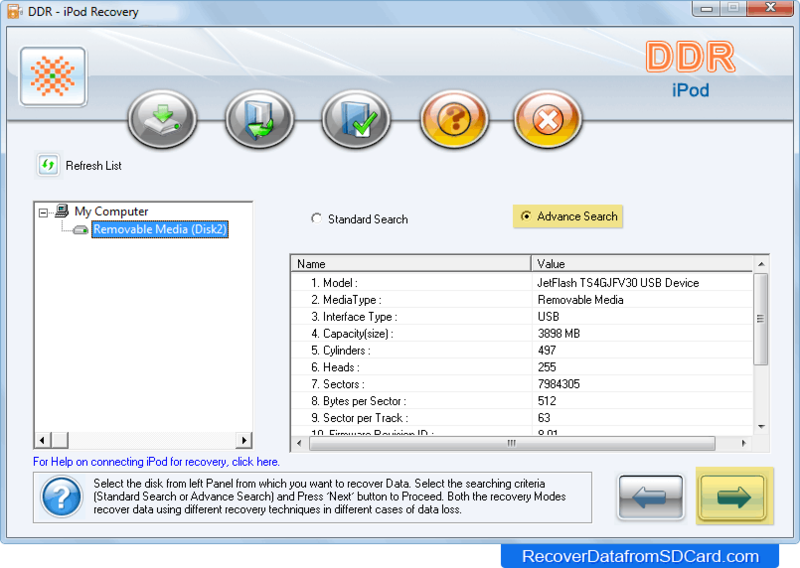 iPod Data Recovery Software retrieves deleted or erased music files and video clips from Apple iPod Shuffle, Mini, Nano, classic and latest iPod mp3 series. Software recovers data even when “Drive not formatted” error message is displayed on your computer while accessing iPod device in your PC. Select any one searching criteria either 'Standard Search' or 'Advance Search'. Click on 'Next' button to continue. Restores lost, missing or deleted files and folders from different iPod models including iPod nano, iPod shuffle, iPod mini and other iPod models. Program uses advanced disk scanning technology to search and recover all lost music files from different iPod models. Recovers data in major data loss conditions such as Accidentally deleted files, Virus or Trojan attack, Hardware/software error, Human faults, etc.